The only thing worse that making a wrong decision is to stick by it, bunkering down behind unsustainable arguments. The GAA's fixture-makers did that for two days, but eventually realised that not only had public opinion whipped up gale force winds behind Kildare's right to host Saturday's football qualifier with Mayo in Newbridge but also attracted a far greater threat. Who knows how far Kildare would have gone if they were forced out of St Conleth's Park? They would have definitely have gone to the Disputes Resolution Authority (DRA) and, if that went against them, perhaps even to the Courts. That would have caused chaos amid the tight championship schedule, which requires next Saturday's Round 3 winners to return for action a week later. And if they are successful there, it's straight into the round robin All-Ireland quarter-finals. So if Kildare and Mayo did not go ahead next weekend, the Round 4 draw would have had to be put back, delaying the entire schedule. We will never know whether it was that fear or the realisation that Kildare were denied an entitlement established under championship regulations which prompted yesterday's climbdown but, whatever the reason, it came just as the stakes were spiralling towards levels that would have left heavy losers on one side or the other. The official line from the Central Competitions Control Committee on Monday was that the game had to be taken out of Newbridge for health and safety reasons. By yesterday, that wasn't a problem anymore apparently. "Following discussions with the Kildare County Committee and An Garda Síochána in recent days, upgraded match-day and traffic management plans involving extra stewarding and gardaí will be put in place to cater for the large crowds (8,200). "The GAA wishes to point out that the decision to fix the game for Croke Park originally was based on serious concerns around the health and safety of patrons attending the fixture. The CCCC has received assurances that these issues will be addressed," noted the statement from Croke Park. Other than generalisations about upgrading traffic plans and bringing in extra stewards, it does not explain how the 'serious concerns' have been allayed. If better traffic management and stewarding was all it took to satisfy CCCC on Wednesday, could they not have worked on it with Kildare and the Gardaí on Monday, rather than announcing the game would be played in Croke Park? Public opinion swung behind Kildare with unprecedented ferocity, portraying them as the victims of heavy-handed bureaucracy. It wasn't quite that simple, but when social media sets about creating a goodies v baddies scenario, more reasoned views are crushed. After all, Kildare had agreed to forgo home advantage for a qualifier in the past (v Limerick 2012) and also switched league games to Croke Park a few years ago. Also, no Leinster Championship game has been played in Newbridge since 1995, yet that hasn't seemed to bother the county board, teams, managers or supporters over the years. Maybe that left CCCC believing that Kildare would happily toddle along to Croke Park next Saturday without raising any great fuss over losing home advantage as ordained under regulations. If so, they were seriously misguided, as subsequent events proved. They will get over the embarrassment of having to overturn a decision they stoutly defended but it weakens them to the extent that future calls are far more likely to face challenge. Rescinding a bad decision is always the correct thing to do, but the fall-out from this week won't end after Saturday's game. In fact, the CCCC could face themselves facing another tough call if Kildare qualify for the 'Super 8s'. It entitles every county to one home game so will the Newbridge issue arise again? Could there be a situation where Kildare play one of the provincial champions - maybe even Dublin - in front of 8,200 spectators? 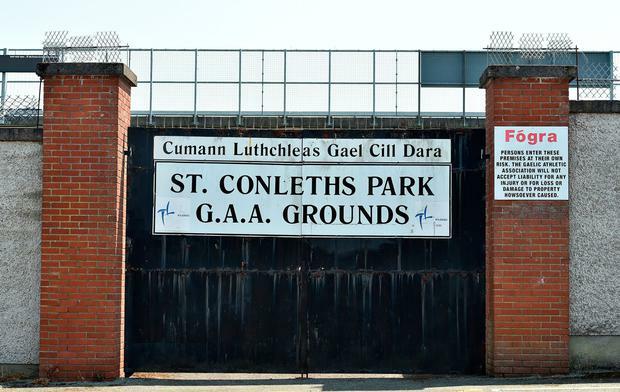 The stipulation that all venues for the Super 8s must be approved by CCCC, subject to health and safety criteria being met, does not rule out playing games at small venues like St Conleth's Park. In fairness to the CCCC, that's an issue for a higher body, possibly even Congress , so it can't even be addressed until next February. The Super 8 concept was sold to counties on the basis that they would each have one home game, but how practical is that where capacity is as low as 8,200, as in the case of St Conleth's Park. In that case, Newbridge is deemed big enough to stage an All-Ireland quarter-final, while not even being considered for any of Kildare's early round Leinster Championship ties. That appears quite bizarre. Kildare's decision to press the nuclear button by threatening to boycott Saturday's game unless they were allowed to host it has worked, something that other counties - and indeed clubs - will have noticed. It will make the smoother running of competitions more difficult everywhere, an unfortunate development at any time but most especially in the modern-day crowded calendar. As for the CCCC, they warrant criticism for getting such an important call wrong but deserve credit for acknowledging it. The pity is that it took so long as instead of all the concentration being on a big weekend of hurling and football action, the focus was on an unnecessary controversy.